This is the second post in a month-long series about procrastination. You can find the first post here: Three All-Too-Common Writing Fears Holding You Back … and How to Beat Them. I think this sense that there are “more important things to be doing” is a stumbling block for a lot of writers. I feel selfish and indulgent when I take time out to write my fiction. I find myself doing my paid writing first (which of course should come first) and everything else that needs doing before I allow myself time to write. By this time, it is usually 10pm at night and my bed is beckoning!! I recently spoke with a fellow writer who also shared her concerns around spending her limited free time “luxuriating” in writing. The struggle of doing more of other activities, attending to more chores, or doing something that others find “a better use of her time.” She was recently told that because her writing isn’t being compensated then it isn’t really a good investment. That’s a shame. For the past three years, I’ve been putting the heat on myself to find an agent and a publisher because I thought I couldn’t justify spending time writing when I should be cleaning the kitchen unless I got a publishing contract. Often, the “more important” things these writers think they should be doing are household chores, like Greta’s sense that she “should be cleaning the kitchen”. While chores need doing, I don’t think most of us would say that chores are the most significant thing going on in our lives. So what lies behind this guilt about writing? One huge issue is that some writers really struggle to see their own writing as something important. They might see writing as something important in the lives of others – of freelancers, perhaps, who make money writing, or of published well-known authors who make lots of money, or of literary authors who might not make much money but who receive critical acclaim. But their own writing seems like, at best, a hobby. And often, it feels like something rather too self-indulgent – like eating too much chocolate, or binge-watching a whole series in a weekend on Netflix. Well, even if writing is “just” your hobby, we all deserve hobbies! And if your writing is something more than that to you – you’re hoping to get a book published, or to establish a new career – then that’s totally valid too. Every day, people start businesses. Every day, they fail. Loads of businesses fail, from tiny ones involving a single self-employed person who later goes back to their day job, to giant ones, headed by CEOs who take twelve years to turn a profit. Why Isn’t Writing Always Seen as a Worthwhile Use of Time? Let’s say you’re a mother to two young children. One is in school; one is at home with you during the day and still has a nap after lunch. When you take time to write during nap time, you feel guilty that you’re not doing something more “productive,” like cleaning the house. After all, you’ll probably never make much money from your writing. Let’s imagine, instead, a father to two young children. One is in school; one is at home with him during the day and still has a nap after lunch. When this father takes the time to draw up a business plan and apply for funding during nap times, you don’t think of him as being “unproductive”. You don’t think “he should get the dishes done instead”. And yet, that father will – statistically – probably never make much money from the business. Now, I realise I’ve drawn stark lines here where there are, in reality, no lines. There are plenty of men who write novels and plenty of women who start businesses. But I would question, in general, whether men tend to feel the same sense of guilt about their writing as women do. As a society, our expectations of women (and the expectations we place upon ourselves) are different from our expectations of men. If I imagine a male writer, in exactly the same circumstances as me, would I think of his writing as worthwhile? If you would – then why isn’t your writing just as important as his? Now, your situation may be different. Perhaps the type of writing you’re doing just doesn’t seem important to you, even though you really enjoy working on it, or maybe you really do have to get all the housework done because you’re a single parent / a carer / the partner of someone who works really long hours outside the home. 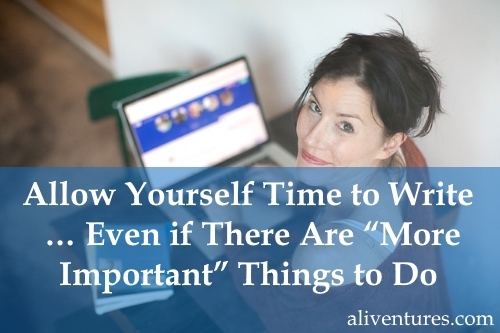 #1: Set aside a specific day or time for writing. Many writers find it easier to feel that they’re legitimately using their time to write if they’ve made a decision ahead of time that “Tuesday afternoons” (or whatever it is) is for writing. #2: Get out of the house to write. I find it a lot easier to sit and write in my local library (which is where I’m drafting this!) than at home because there’s literally nothing else I “should” be doing when I’m in the library. #3: Schedule housework. The nature of housework or chores around the home is that there’s always more that could be done. You do one load of laundry and there’s another load within hours (or at least it seems that way in our house). It’s all too easy for housework to take up the whole of your day. One way round this is to schedule it in:give yourself a specific slot each day/week when you clean, and have a rota on what you do when. #4: Meet with other writers. If you can join an in-person, local writing group, I highly recommend that. But if that’s not possible or practical for you, online groups can be hugely helpful and supportive too. Simply talking about writing with other writers can help you realise that your writing is valid and significant. If you struggle to see the worth of your writing, or if you often find yourself hesitant to write or feeling guilty about writing because there are other things you “should” be doing, please do feel free to reach out in the comments below or by email. I’d love to be able to send you some encouragement. Also, if this is a battle you’re fighting at the moment with yourself, do let us know what’s working for you: maybe your tip will help someone else in a similar situation. Hang on in there, and keep writing – it is important and worth prioritising. 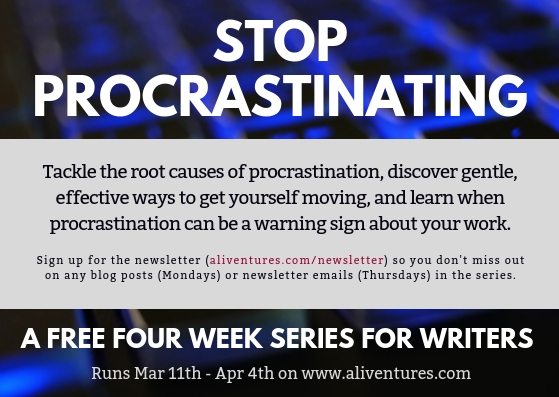 Over the next three weeks, I’ve got more posts (and newsletter pieces) planned about why writers procrastinate, how to focus (and refocus), how to know when procrastination might be due to a problem with your writing, and more. Make sure you’re on the newsletter list so you get the Monday blog posts and the short Thursday newsletters straight to your inbox. On the subject of scheduling things and motivating yourself, Habitica.com is a really good site for building habits and stuff – in game form! It also has social guilds and etcetera – at the moment I’m in one called Fanfiction Connoissuers, but it’s certainly not just for fanfiction writers! There’s a lot of discussion about writing and good tips and advice, and a lot of challenges to join to help you be a better writer. Try it out (site and/or guild)! FFC has really helped me with my writing. Your post really hit home for me. I work as a caregiver so I feel this guilt every day. I have someone close to me that feels my writing is a waste of time of it doesn’t make money. So I do it anyway! Thanks for the tips Ali! Oh, that sounds really tough, Cheryl. It’s very hard when loved ones aren’t supportive — and good on you for carrying on anyway! We just have to remember the more we write the better we become. We must strive to continue to put in the work even if we don’t see any results or outcomes now/immediately. Eventually if writing is your calling then you will succeed. The money will come in later don’t fret. You have to always make time for something no matter what it is. Whether you have to make time to clean, your family, go out for dinner. Everything takes time to do so why not write and use your time wisely! Hi, I am a married man but I still have all these feelings. Thanks for the tips, trying to figure out what works for me best! Thanks for sharing your experience, Dani — hope some of these things help you!